The “Completed by Mom” distinction was also evident in Longmire and Company’s 2009 Economic Impact Study on College Enrollment. Parents of prospective college students were surveyed and we found mothers completed the survey by more than 2 to 1 over fathers. These three examples give admissions officers a true glimpse into the heightened interaction of parents, in particular mothers, into the 2010 college search process of their children. What do mothers really want their children to have when on campus? How do college admissions offices get dad more involved? What does that take? When does that happen? What are the differences and distinctions between the parents in deciding what campus their child attends? And, does this meet the ultimate goal of finding the right fit for the student? I look forward to finding out more from the “Black Hawk” moms and dads when the results come in from our October 2009 co-sponsored study of parents and how they evaluate colleges and influence enrollment. Talk to an admissions counselor about some of their phone calls to prospective students and you might see some eyeballs rolling back into heads. Talk to some prospective students about some of the phone calls they get from admissions counselors and you might see some eyeballs rolling back into heads. Sound like a disconnect between students and counselors when talking by phone? You bet. It happens all the time. There is a fix, though – something that can make the conversation richer and more helpful for both the student and counselor. The key lies in an interruption of the pattern that is commonly practiced by counselors and expected by students. A little foundation: in a recent co-sponsored study we conducted for participating colleges about communicating with prospective students we asked students to tell us which methods they find most and least helpful in how colleges communicate with them. That survey question, by the way, was open-ended to elicit the qualitative insight that proves so valuable. We recorded a large number of students who said telephone calls from admissions counselors were among the “most helpful” methods that colleges use to communicate with them. We recorded an equal number who said it was among the “least helpful” methods. What gives? You could speculate that there are simply some students who prefer phone calls and others who don’t. A review of the qualitative data suggests something different. You can see the difference. For the bad calls, the information flow is clearly college-to-student. So many admissions counselors have been conditioned – whether through explicit training or by some self-perception – that they should communicate ALL of the features and benefits of the institution. For the good calls, on the other hand, the flow is clearly student-to-college. Students ask questions. And they ask questions. And they ask more questions. Asking questions means they are intellectually and emotionally involved in the conversation. That level of involvement gives you a great chance of building a bond that will yield enrollment. When Longmire and Company visits campuses to conduct Interactive Training Workshops for counselors, we focus on the tools and techniques that counselors must use to put students in a frame of mind to open up and ask questions. This includes proper use of close-end and open-end questioning, as well as asking open-minded questions that spark dialogue from otherwise non-verbal prospects. I can guarantee one thing. A prospective student will engage, comprehend and remember any conversation that hits them at an emotional level. That’s the goal. Every conversation should be measured on that basis. Not too long ago, as part of a consulting engagement, I was meeting with the head of enrollment and we were reviewing the many strategies and tactics that make up their marketing and recruiting plan. A number of items caught my attention. Frankly, I wondered if they were working effectively for this institution. Unfortunately, this mind set is all too common. It is the nature of most departments to add even more strategies and tactics to the marketing plan while failing to eliminate the ineffective ones. Through our consulting engagements and on campus Interactive Training Workshops, we stress the importance of using systems thinking to evaluate which strategies and tactics need to be added and deleted from an institution’s playbook. The “5 Whys” and root cause analysis used in systems thinking is a quick way to validate or invalidate any current or proposed strategy or tactic. The process gets at the root of the need and forces you to take a completely objective view of ROI. The video below was recorded at a recent Interactive Training Workshop that Longmire and Company conducted for a university in Michigan. As you can see, the benefit of systems thinking was clearly evident to the attendees and, even more importantly, so was the importance of following through on the conclusions derived from the exercise. Don’t call it intuition. Rather, call it a rapid cognitive response that delivers, in the blink of time, the best decision you can make, the most accurate perception of a situation, the best pathway to success. According to author Malcolm Gladwell in his book Blink, the actions you take based on your most immediate thoughts and perceptions are the ones that most often serve you best and drive your best course of action. Blink is a book that takes you on an intellectual journey. If you have a tendency to over-analyze, this book brings you back down to the firm footing of the planet Earth and your own intellectual and emotional capital. It provides reassurance that the snap judgments you make every day, on items of simple or supreme importance, can be trusted. You’ll see this at work with prospective students with a successful campus visit. They’ll take it all in. Connect with a current student. Encounter a friendly professor. Find something in the environment that they respond to emotionally. Then, in a blink, they know they’re home. They know your institution is where they want to go to college. All of the external is internalized. How much do colleges design their campus visits, or communications programs for that matter, around the tiny but critical stimuli that add up to awakening a student’s motivation to attend? Not enough. But they could. 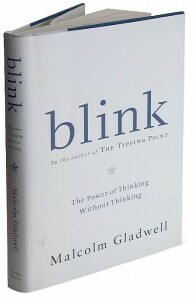 Learn more about Malcolm Gladwell and his other best selling books at www.gladwell.com.